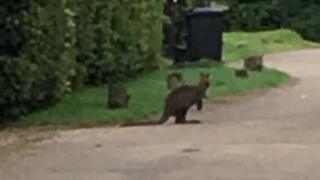 A wallaby has been spotted hopping around part of Oxfordshire by a binman on a collection round. The marsupial was seen earlier in Shepherd's Green village near Henley-on-Thames. "A crewman managed to get one picture before the animal bounded off into some bushes," a spokesperson from the waste company Biffa said. The RSPCA is investigating whether any further sightings have been reported in the area. Beale Park is a wildlife attraction based about 10 miles (16km) away in Berkshire and keeps wallabies but it said none of its animals had escaped. BBC Oxford understands a man in the area keeps wallabies privately and they sometimes run off, resulting in occasional sightings. In 2004 Tiggywinkles Wildlife Hospital said accounts of wallabies living wild in Buckinghamshire and Oxfordshire had increased. At the time it was thought the animals had escaped from country estates or wildlife parks in the area. Commenting on social media about the most recent sighting, one poster called Christine Atkinson, said she had previously seen a wallaby in the nearby village of Nettlebed.